Stately Victorian beauty, with picturesque in-ground pool on a double lot, in highly sought-after Garrett Park. Circa 1878, this elegant home boasts original wood floors, exquisite millwork and wonderful architectural details including vintage lighting fixtures, intricate wood trim, window transoms, and custom built-ins. 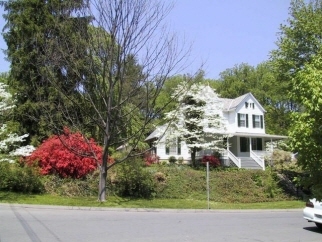 It is one of the earliest houses in Garrett Park, ideally located across from tennis courts and the town center. This distinctive residence offers an inviting wraparound front porch, a handsome entry foyer, formal living room with fireplace/mantle and ceiling medallion, elegant dining room, eat-in kitchen with stainless steel refrigerator, gas stove, display shelving and large pantry. Adjacent to the kitchen is perfect office space that overlooks the gorgeous landscaped garden, and a convenient mudroom / laundry room with access to rear yard. The first floor addition boasts a modern family room / guest room with three exposures. This extraordinary property is nestled in the heart of Garrett Park. Garrett Park is known for its close-knit community and independent spirit! Garrett Park boasts its own post office, swimming pool and café. This property is conveniently located near the Marc train, Strathmore, Grosvenor and White Flint Metro and White Flint Mall.